If you would like to completely seal in your canopy so that you have a tent that completely shelters everyone from the elements, then you need to let Undercover provide you with the necessary tools to get the job done and to get it done right. 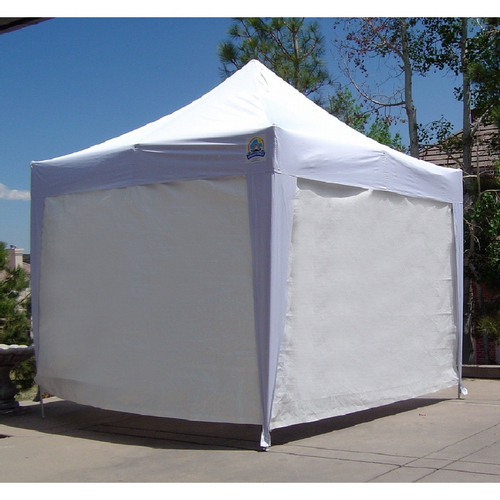 With their Zippered Poly Sidewall, you have a Set of Four walls that has been engineered to fit seamlessly with your canopy, making sure that you and all of your guests are properly protected from whatever surprises the weather might have in store for you. How do the walls attach at the top and the sides? According to the manufacturer, with this particular product, the walls will attach via velcro to the top at the valance. There are loops down the legs to tie it to them, and finally the walls zipper together at their sides to give you ultimate coverage. Do one of the sides zip in the middle for the front of the tent? Yes, one wall will have a zippered entrance. Are the sidewalls waterproof or water resistant? What are they made of and what is the strength of material? Are they heavy duty of umbrella material? Do they get wet through if raining? The sidewalls are polyethylene, which is a waterproof material that will be resistant to mold and mildew. While the sidewalls are rip resistant, this material is a thinner material made for portability and not necessarily durability. Will these side walls fit on the UC-3P10W? Yes, these walls are intended for use with the UC-3P10W. Will this fit a UC 3P10W cover shade? Yes, these wall will work on the UC-3P10W, with the dimensions of : Overall footprint: 10' x 10' Peak height: 10.5' Head clearance: 84"
So these are zippered on all corners, with only one of the sides having a center zipper? What are the actual dimensions? How do they attach to the frame or canopy at the top? Do they have grommets or Velcro? Yes, this kit has three solid sidewalls and one middle-zipper sidewall. All walls have zippered edges to connect to one another. The sides are 10 feet wide each and approximately 7 feet tall. They attach to the frame with Velcro-like fasteners. Can you use these walls with the 10 x 20? Yes but it would not completely enclose the canopy. You need a total of 6 to completely enclose the 10 x 20 so you would need to purchase 2 sets. Undercover Poly Sidewalls were just what we needed. Sides fit our canopy, arrived fast and the price was reasonable. Would buy from eCanopy again. VERY easy to install, and the length is great! No more wind issues with this outdoors! The walls are functional and easy to set up. After purchasing the 10x20 ez up tent for our BBQ cook offs we invested in the sides for this incredible tent. The sides are just an additional awesomeness. I highly recommend this tent and the sides to anyone in the market for and exceptional tent. I am very happy that I ordered these side walls for my 10'x10' tent. They are strong, have plenty of Velcro attachment straps and the whole thing zips nicely together to provide a waterproof shelter. Canopy Sides Make Ez-Up Set Up a Breeze! The package arrived in two boxes (we ordered two sets) with easy to follow instructions. The sides connected with ease and made our tent space private in less than twenty minutes. ConsOnly one in the set has a zipper in the middle, making it only usable as a regular tent. I would have liked to be able to have another tent options. We have used the sidewalls under two very different conditions in the last week and they proved very effective in both situations. They are easy to install; but very stable and provide a good shield from the elements. The service was quick and efficient. Thank you. ProsEasy to pack, carry and install. ConsIf I had to change anything, I would have zippers in two of the panels.